Thank you, Kathryn, and all your furry friends and familiars, for inviting me to be a guest blogger on The Nut Press. I’m really delighted to be here today, and to have the chance to chat about my new novel The Golden Chain. A few years ago, I was rummaging around in what is charitably called my memory bank, trying to find the teenage and twenty-something faces of some people with whom I went to college, and who were organising a school reunion. I also found the memory of my first teenage romance, and I thought – I just have to write a novel about falling in love for the very first time. I don’t know about you, but that first love – talk about being hit by a juggernaut, which then drives off leaving you bruised and broken and damaged for life. Or so you believe while it’s all happening. As I planned the novel, it all came rushing back to me – the elation, the misery, the insane optimism, the fear of losing the beloved – all those extremes of emotion which go with growing up. So – The Golden Chain is the second story in a trilogy of novels about three British families and three pairs of lovers living through WW1, the Depression of the 1930s, and finally WW2. All the novels tell a complete story, but the second and third books pick up on elements from the first one. So, if a reader wants to know what happened to any of the characters in the first book, there’s probably going to be a way to find out. 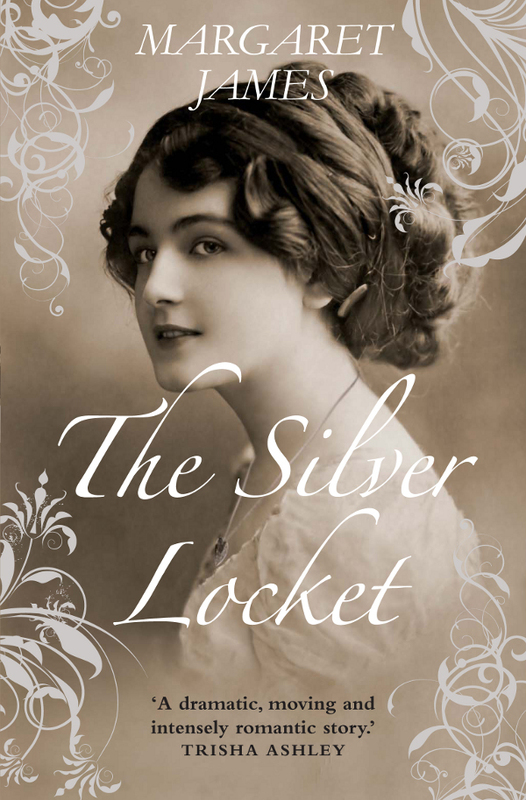 This first novel in the trilogy is The Silver Locket, a wartime romance in which landowner’s daughter Rose Courtenay falls for local bad boy Alex Denham, who also happens to be married. Rose’s parents expect her to marry a different, much more suitable man. If Alex and Rose hadn’t fallen in love, their lives and those of their descendents would have been very different – and a lot more boring, too. 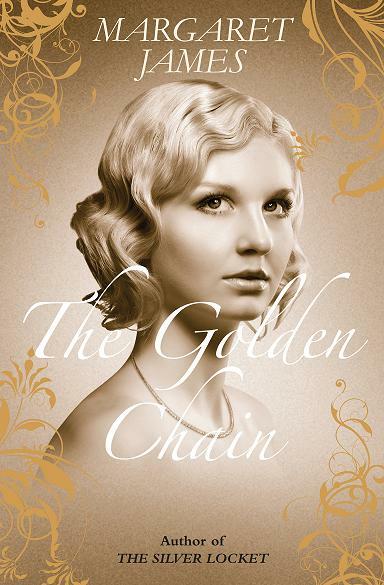 The Golden Chain is the story of aspiring actress, singer and dancer Daisy Denham, Rose’s and Alex’s adopted daughter. Who are Daisy’s birth parents? She wants to know, too! In some ways, the story is perhaps a 1930s take on Shakespeare’s Romeo and Juliet. Like Romeo and Juliet, Daisy and wannabe actor Ewan Fraser (a green-eyed, handsome Scotsman with copper-coloured hair) are attractive, emotional, idealistic teenagers and, although nobody ends up dead in the family tomb, their families aren’t exactly delighted when Daisy and Ewan fall in love. But Daisy and Ewan don’t care about what their parents think, and his gift of a golden chain seals the deal. Ewan and Daisy join a company of touring provincial players and, for a while, everything goes well. But then an older, more sophisticated man joins the group, he bewitches Daisy, and she breaks Ewan’s heart. Ewan’s big ambition is to play Romeo and for Daisy to be his Juliet. As the story unfolds, it looks as if this isn’t going to happen any time soon. But this is a feel-good romance, so there’s definitely going to be a happy ending. Of course, this happy-ever-after won’t come before both Ewan and Daisy have grown up a lot, suffered a few setbacks, and worked out what they really want out of life. 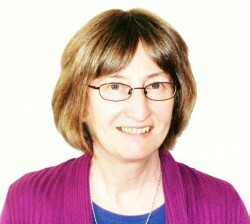 Margaret James is a novelist, a journalist working for the UK’s Writing Magazine, and she teaches creative writing for the London School of Journalism. She’s written a dozen published romantic novels (we’ll forget about the many ghosts and skeletons of unfinished novels gibbering away in the cellars of her hard drive, ahem), and she hopes to write many more. She’s on Facebook and you can Follow Margaret on Twitter. She has a Blog and an Author Website. are both published by Choc Lit and are available to order/pre-order from Amazon UK or The Book Depository. If you’d like to win a copy of The Golden Chain, please leave a comment below by midnight on Wednesday, 6th April. Do you have a favourite piece of jewellery? If so, what is it – and why is it special to you? Thanks very much for stopping by The Nut Press, Margaret, and for talking about your books, The Silver Locket and The Golden Chain – they look like pretty jewellery items themselves. How gorgeous are those covers! And they sound like fabulous stories. I’m looking forward to reading them. Ahh! first love. I was 5, so was he. I wonder what he’s doing now… Ahem, where was I? So anyway, my favourite piece of jewellery is my engagement ring (not very original, I know, but I don’t have much jewellery). My clever husband took me with him to choose it (wise move!) after he’d proposed, and we came home with a beautiful sapphire ring. It’s a bit different because the sapphire’s oblong with diamond baguettes around it and I just love that we found it together. I took that as a good omen. Thank you so much for inviting me! I had great fun talking to you and the furry ones. Your engagement ring sounds gorgeous – I love sapphires. I loved The Silver Locket and can’t wait to read The Golden Chain and find out more about those fantastic characters. Oh, how beautiful! And if it was still in the shop three weeks after you first saw it, my tortured brand of logic says that you were meant to have it. Thanks for dropping by and sharing, Morton. My favourite piece of jewellery is my Golden Locket, I wear it every day, bought by my true love and inside there is a photo of my first born with a lock of his hair and teeth marks….! whenever I held him he would grab the locket and put it in his mouth… lovely memories… he’s now a big argumentative 17 year old but lovable all the same. I like how you cleverly combined both book titles in your piece of jewellery there, Diane! I’m very tactile so I kind of like that there are teeth marks are on the locket… it was your (then young) son’s way of putting his own stamp on it. My favourite piece of jewellery is my wedding ring. It was my Mother’s; when she died, everyone else in the extended family got clothes/etc., but nothing fit me. My Dad saved the ring for me, & gave it as well as his ring to my husband when we got married. That was so thoughtful of your Dad, especially as he gave you his own ring to go with it for your husband to wear. I really enjoyed reading this interview – I am going to look out for these books as I know that they are the kind of books that I enjoy reading. Your grandmother’s ring sounds amazing! Squizz and I like fabulous and flamboyant!! I had to comment here, as the books cover precisely the period of history that I love, and I’ll certainly be reading them as I find it hard to resist anything set in the 1920s and 1930s. My favourite jewellery is definitely my one and only ring. Originally it was a piece of costume jewellery that I picked up cheaply in a market; I fell in love with the design (a swirl, studded with little stones) instantly. My parents decided to have it copied in gold with diamonds for me. It was their way of saying thank you for my helping them through some difficulties the previous year – which wasn’t needed. It’s special, purely because they bought it for me. But the really nice thing is, I still have the original costume version of the ring – and I’ll never get rid of that either. Thanks very much for visiting, Winn, and for sharing such a wonderful story – or two wonderful stories, one about the original and the “copy” your parents had made for you. I’m sure you deserved it – they certainly seemed to think so. There is a place in Spain which shall remain nameless as I don’t want anyone else to go there as it’s a magical village by the sea. There is a jewellers shop there that makes silver jewellry. My partner bought me a “stress”ring made of antique silver which when placed upon ones finger has a revolving band. This band alleviates stress when “activated”. I wore it on the plane going home and became engrossed in a Margaret James novel. I am a very poor flier but have to say that a combination of the ring and an excellent book made the journey pass far better than usual. So the stress ring is a favourite piece of jewellry and is a constant reminder of a happy fortnight in a magical place. You make the village sound like a Spanish Brigadoon-on-Sea, Jan – the kind of place which vanishes when you leave, so that the secret remains with you. The ring/book combo certainly seems to have done the trick for you… Are you sure you won’t tell me where it is? I could really do with a stress ring at the moment! Congratulations to ‘inawelshgarden’! You’ve won a copy of The Golden Chain. If you DM or email me your address, I’ll arrange for it to be sent out to you. Thanks very much to everyone else who stopped and shared such wonderful stories about their favourite piece of jewellery and every success to Margaret and The Golden Chain!